This tea scoop set is made from high quality China Moso Bamboo which grows in the high mountains. The process to produce bamboo tea wares involves cutting the bamboo into thin slices and then compress them into different shapes. Moso Bamboo is considered the best material to make tea accessories due to the durability and classy appearance. Tea Scoop 20 cm For scooping 3 to 5 grams of tea leaves. 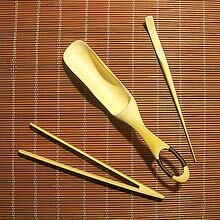 Tea Tongs 17 cm For handling hot tea cups during sterilization. Spout Needle/Spoon 17 cm One end is the needle for keeping the teapot spout free from tea leaves. The other end acts as a spoon for measuring small amount of tea leaves.